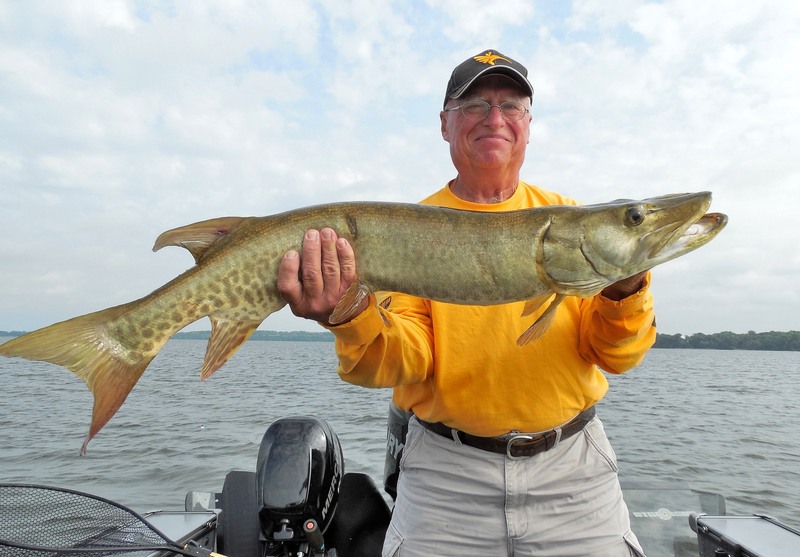 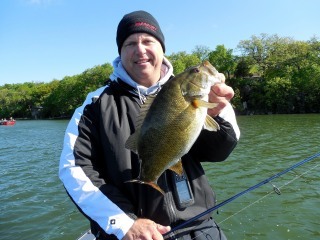 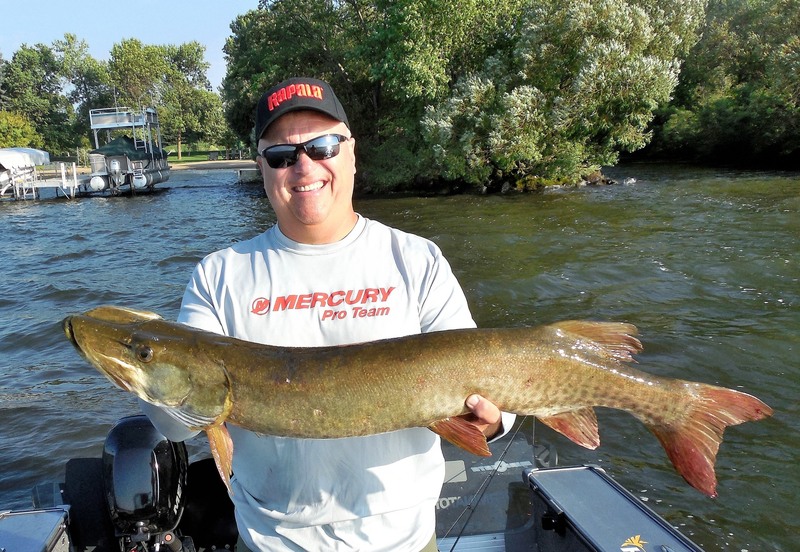 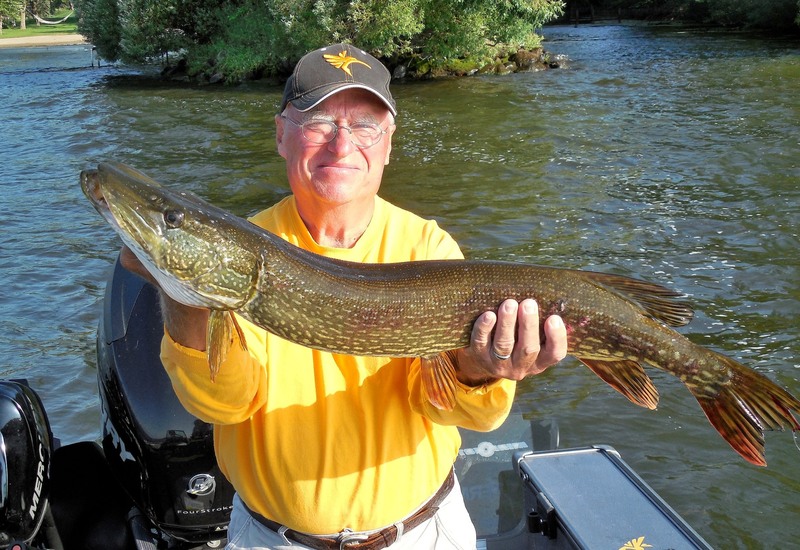 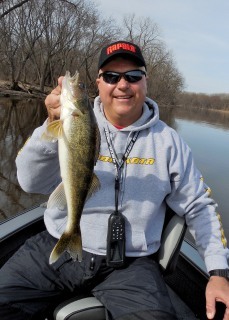 For more, up-to-date fishing reports, go to Fishing Minnesota/Hostspots Outdoors. 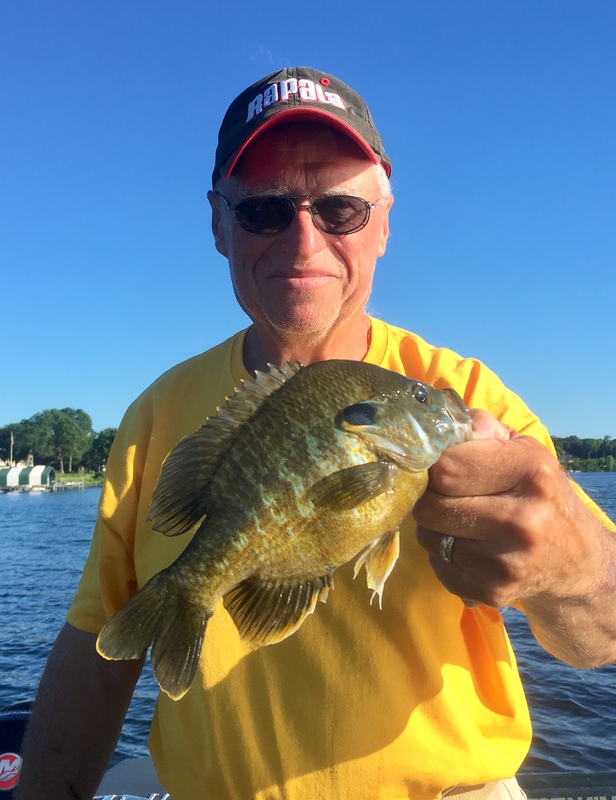 Click on Forums, and scroll down to Hutchinson Area Fishing Reports, Mille Lacs Fishing Reports, and Twin Cities Metro Fishing Reports. I post regular fishing reports on each of these forum pages. 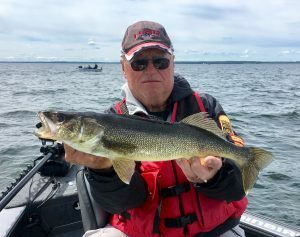 Also check out my video fishing reports and fishing tips videos on Angling Buzz, Target Walleye, and my You Tube Channel (short how-to video segments and a feature-length show (Fishing and Hunting the North Country) covering seasonal topics to educate and entertain). 12/9/18 Finding enough ice to walk out on west Metro area lakes. 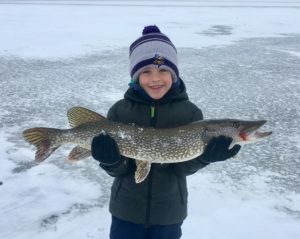 Early ice bite is on. 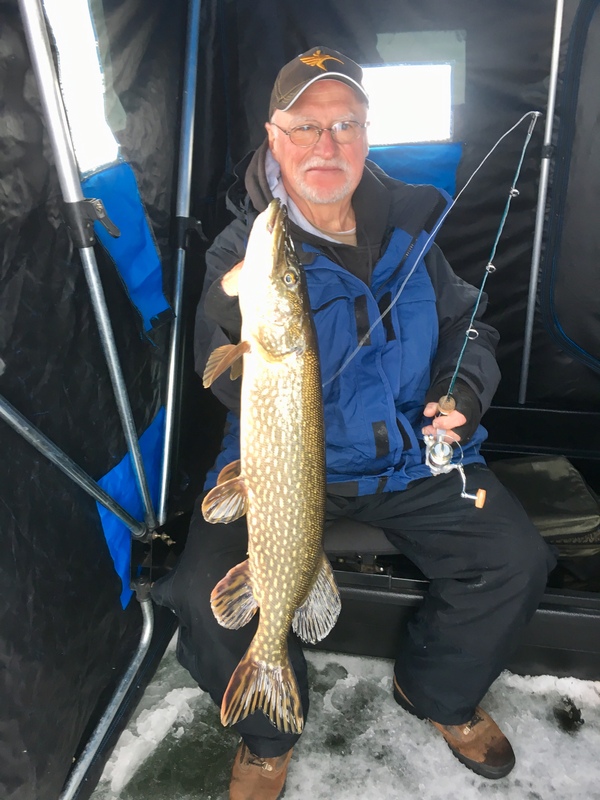 We caught several nice pike on a small west Metro lake with 6-8 inches of ice. 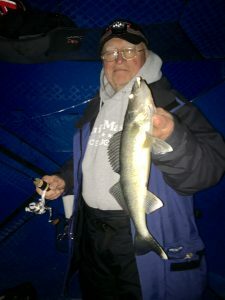 Caught them on medium suckers under tip ups and small sucker minnows on large jigging spoons in 7-9 feet of water along a weed edge. 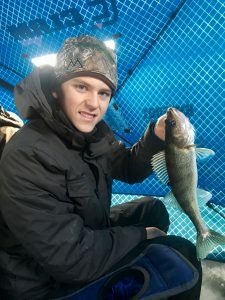 This early ice bit for pike, walleyes, and panfish will continue for a while as the ice continues to get better. I do have some weekend dates still open if you would like some help getting on the fish. Good luck, be safe, and I will see you out there somewhere. 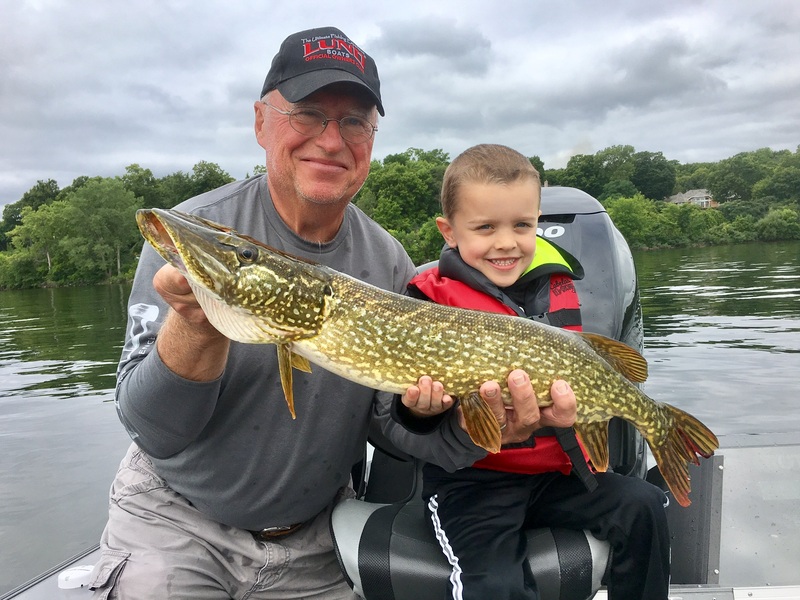 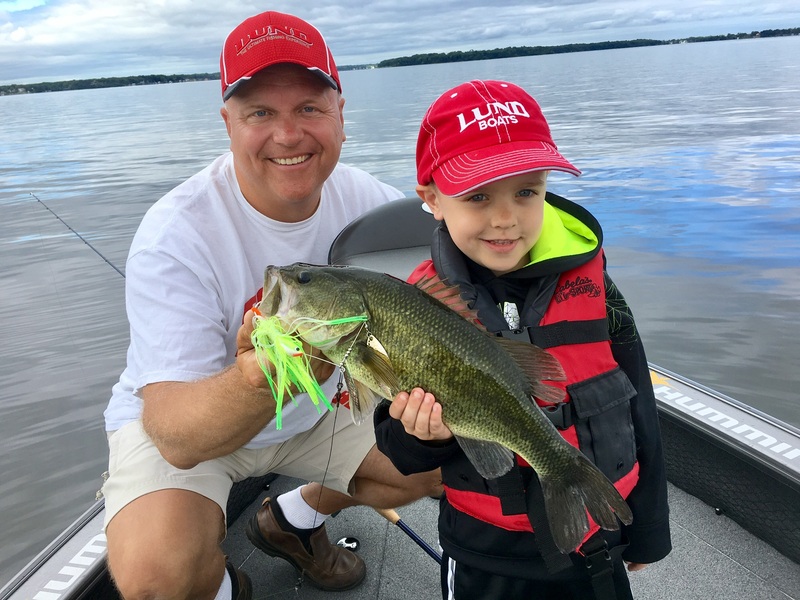 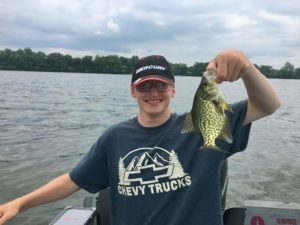 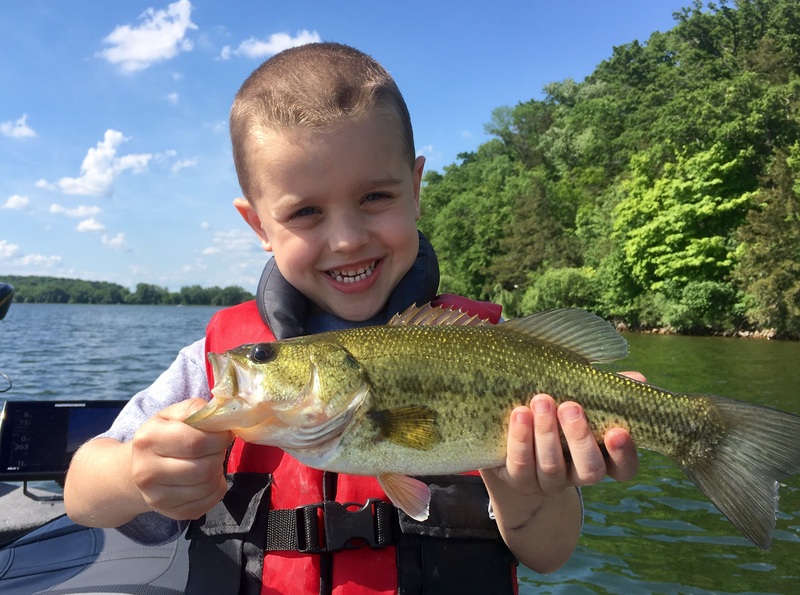 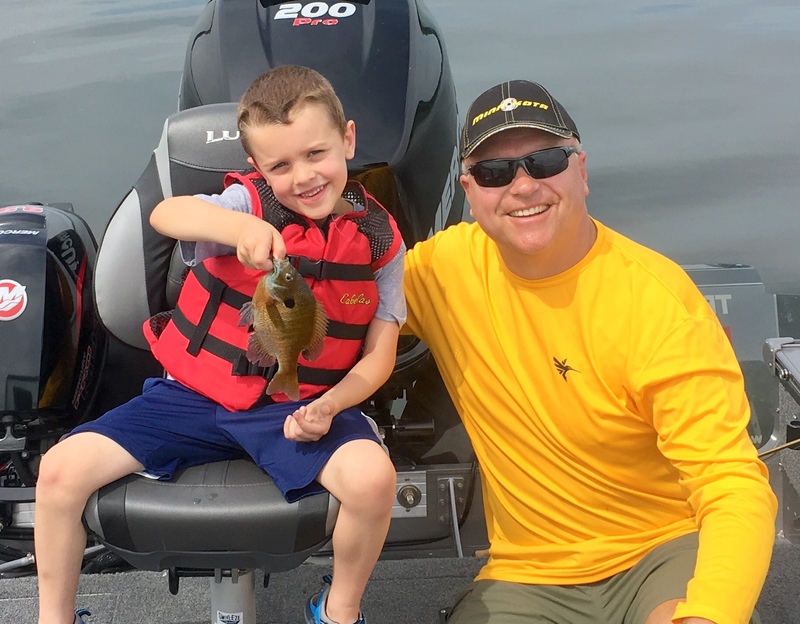 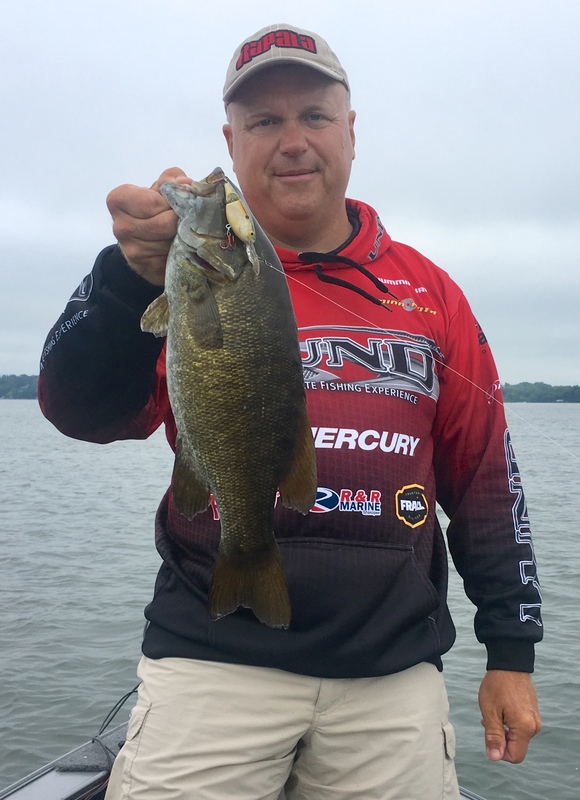 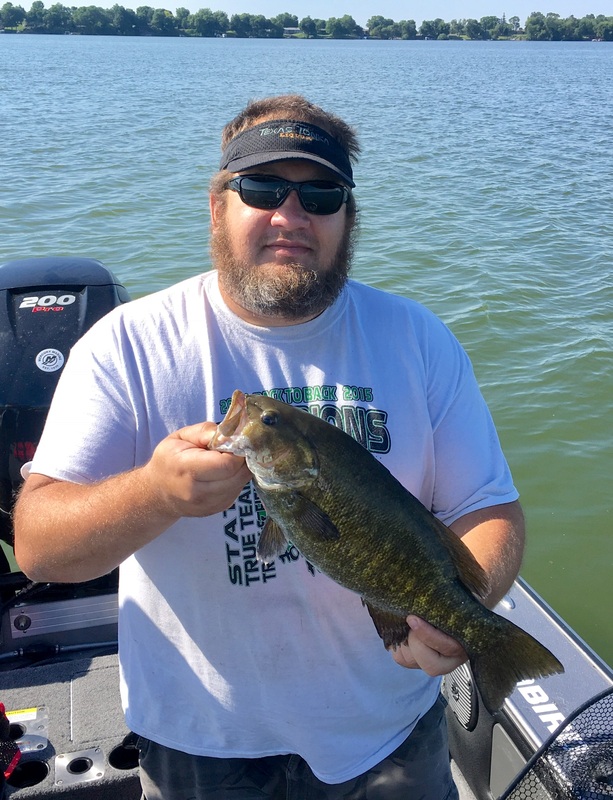 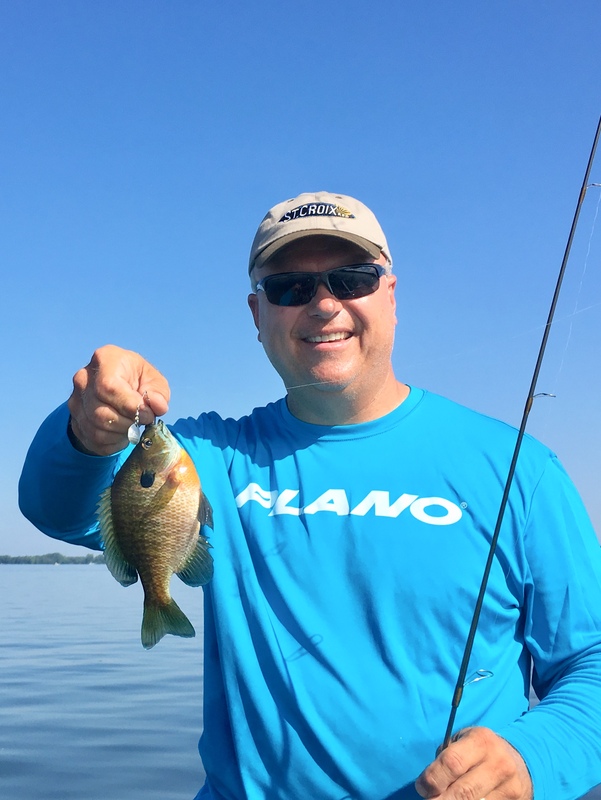 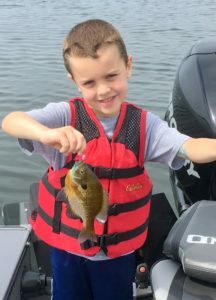 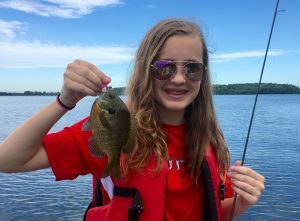 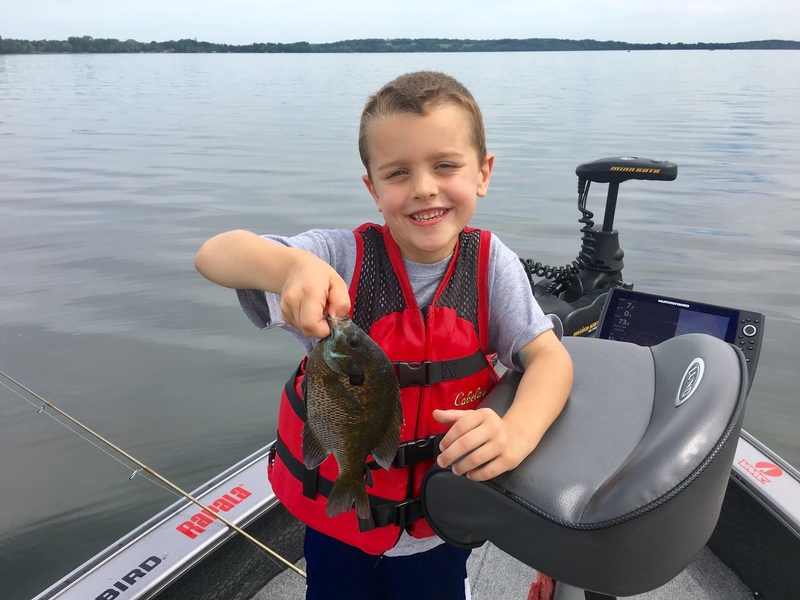 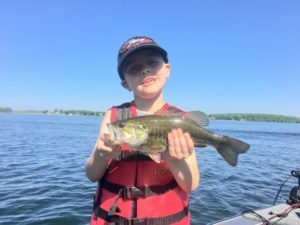 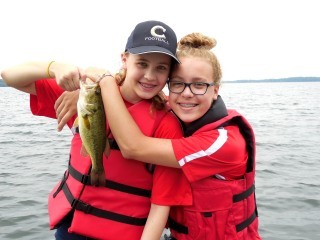 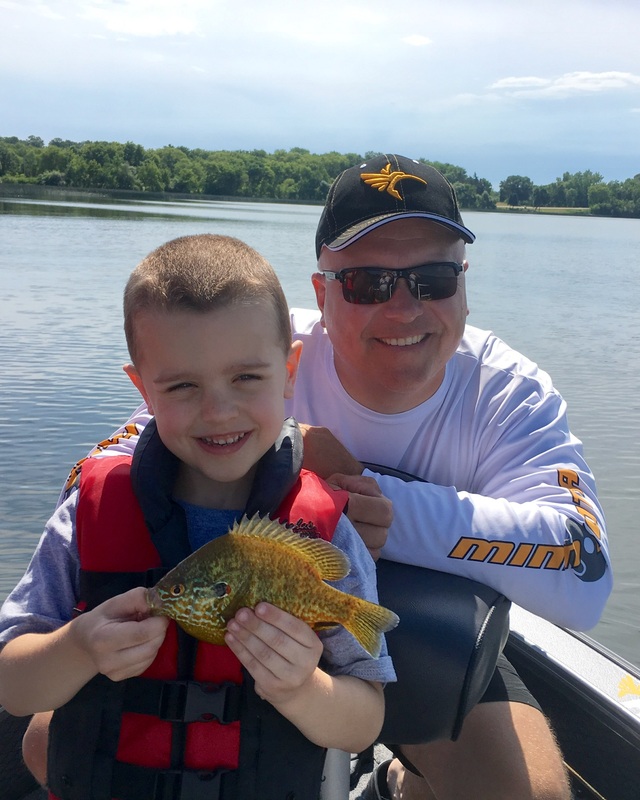 7/26/18 Catching largemouth bass, smallmouth bass, pike, crappies and sunfish on Hutchinson and Metro area lakes. Catching numbers and size. Crankbaits, spinnerbaits, jig spinners with plastics, and plastics under slip floats are all working well. 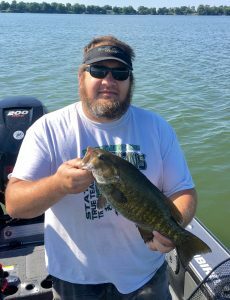 I have a few openings left this summer. Good luck, and I will see you out there somewhere. 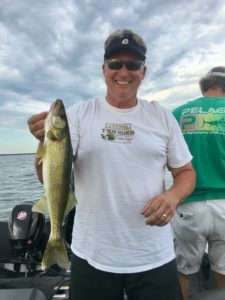 7/10/18 We are catching tons of walleyes of all sizes on the deep mud flats on Lake Mille Lacs. Live bait rigs with leeches, spinners with Gulp! 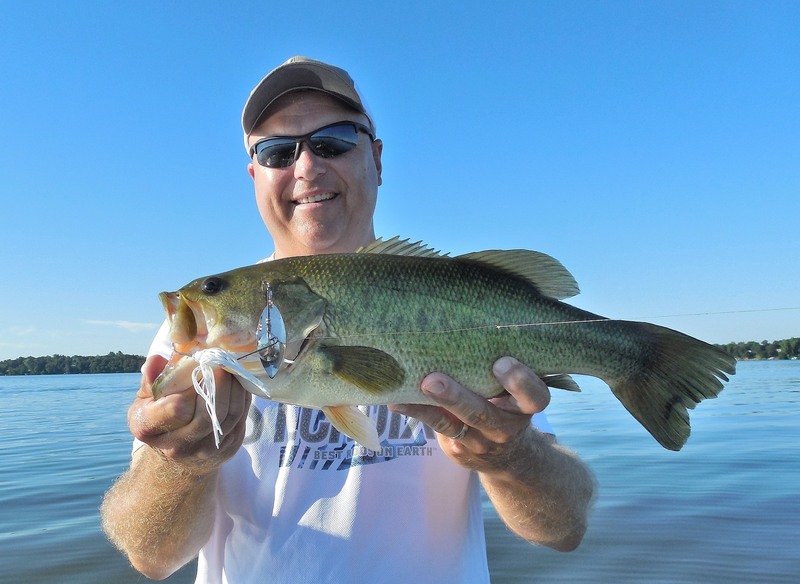 crawlers, and leeches under slip floats are all catching fish from 15 to 28 inches. Forty to fifty fish days are common. 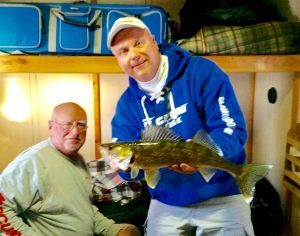 We are also catching walleyes and smallmouth bass on the mid-depth rocks on Mille Lacs. Leeches under slip floats, crankbaits, jerkbaits, Rippin’ Raps, and soft plastic tubes, curly tails, and paddle tails are all catching tons of fish. 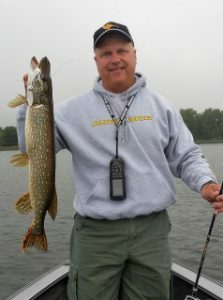 I have a few summer openings if you want to get in on this great fishing. Good luck, and I will see you out there somewhere. 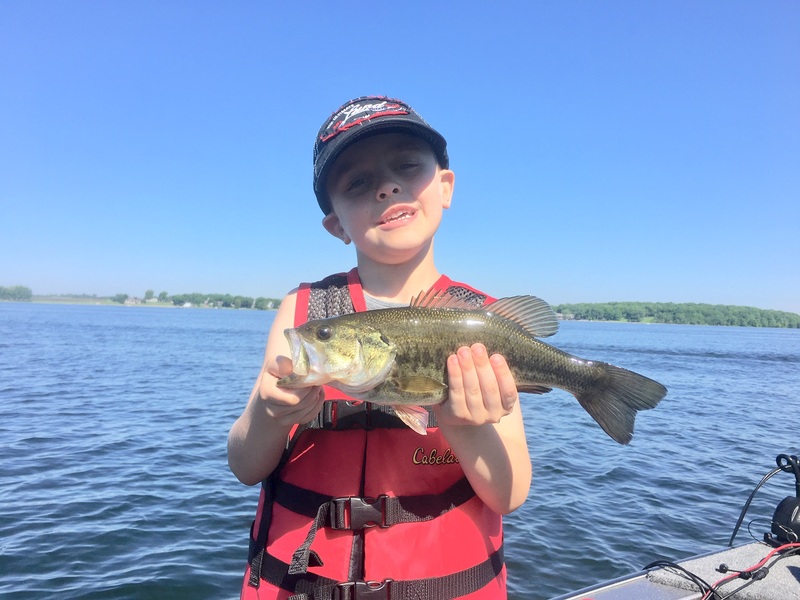 6/25/18 Largemouth, pike, and walleyes are biting on west metro area lakes. Inside weed edges and weed flats with sparser weeds like cabbage and coontail are where we have been concentrating. 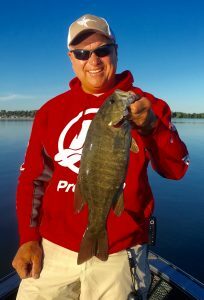 Crankbaits, jerkbaits, jig spinners, swimbaits, and spinnerbaits have all worked in the right conditions. Good luck, and I will see you out there somewhere. 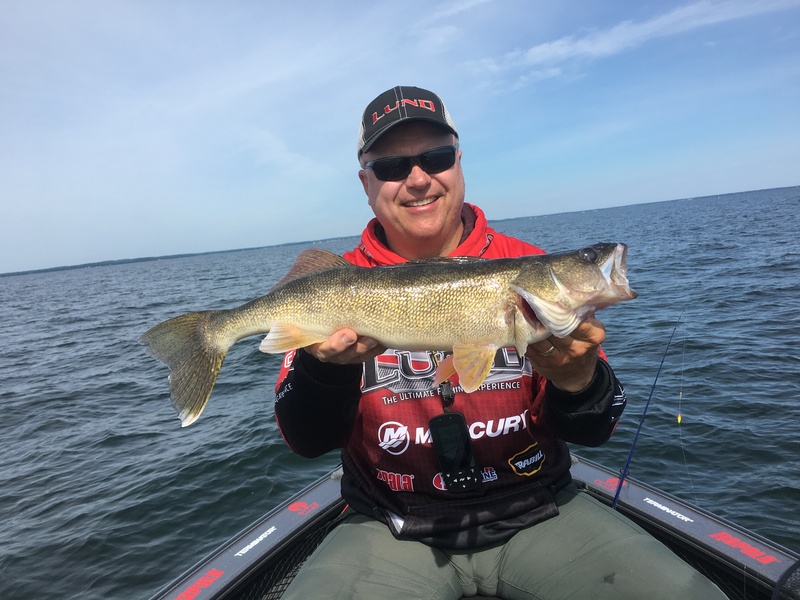 6/19/18 Walleyes are chewing on Mille Lacs Lake. 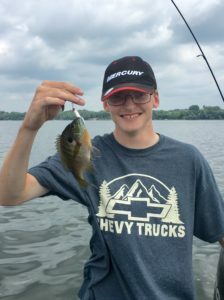 You can catch fish on the shallow and mid depth rocks when there is wind, and out on the deep gravel and mud when it is calmer and brighter. 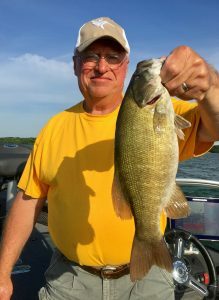 Slip floats with leeches suspended under them are the best bet on the rocks, and live bait rigs with leeches or spinner rigs with crawlers have been our best producers on the deep gravel and mud. Good luck, and I will see you out there somewhere. 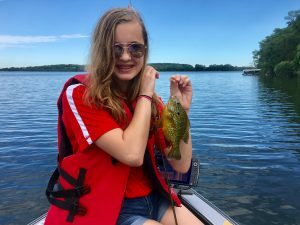 6/10/18 Sunfish are bedding on west metro area lakes. Catching tons of male bluegills on 1/16 ounce jigs tipped with a 1 to 1.5″ soft plastic under a slip float. Get a kid out to enjoy this great fishing while it lasts. 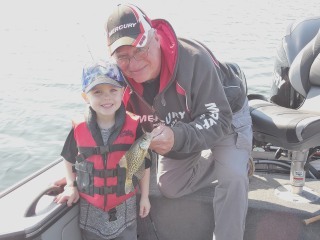 Good luck and I will see you out there somewhere. 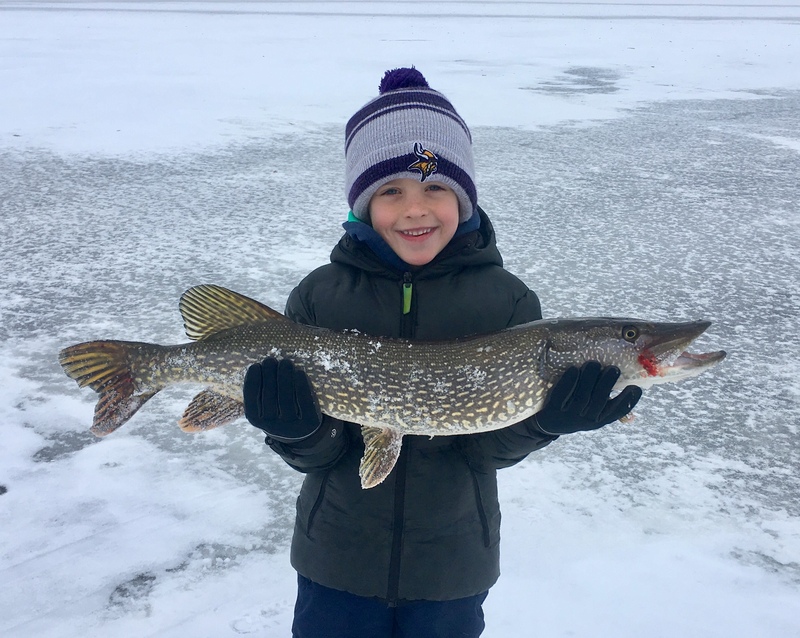 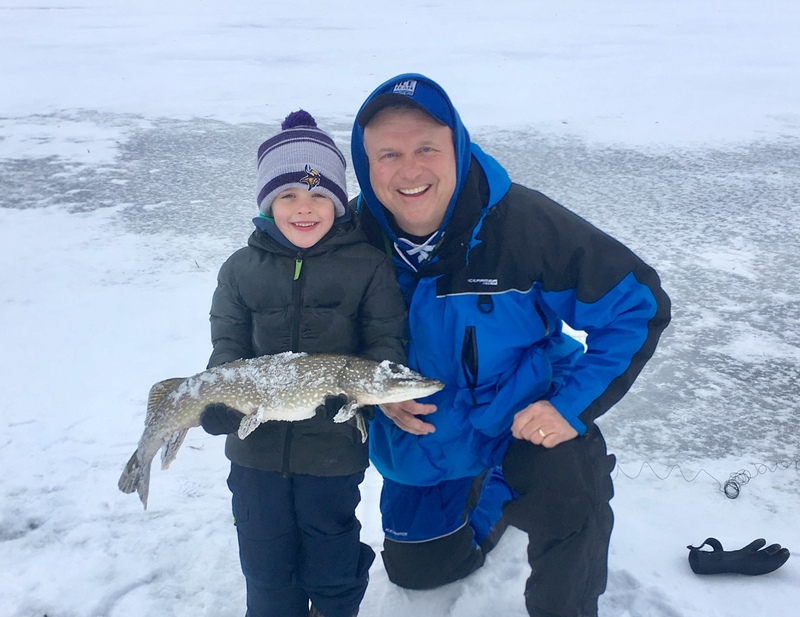 1/8/18 Catching panfish and pike on Metro area lakes, and walleyes and perch on Mille Lacs. 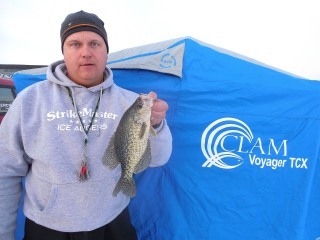 Good ice thick enough to drive on now after the cold snap. 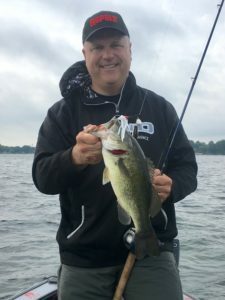 Fishing will continue to get better now. I have dates available to ice fish the next couple months. 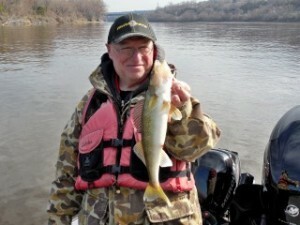 Good luck, and I will see you out there somewhere. 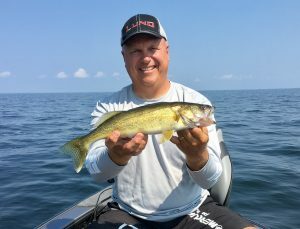 8/20/17 Catching walleyes and smallmouth bass in large numbers and of all sizes on Mille Lacs. 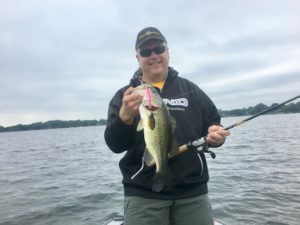 Catching fish shallow and deep on crankbaits and leeches under slip bobbers. 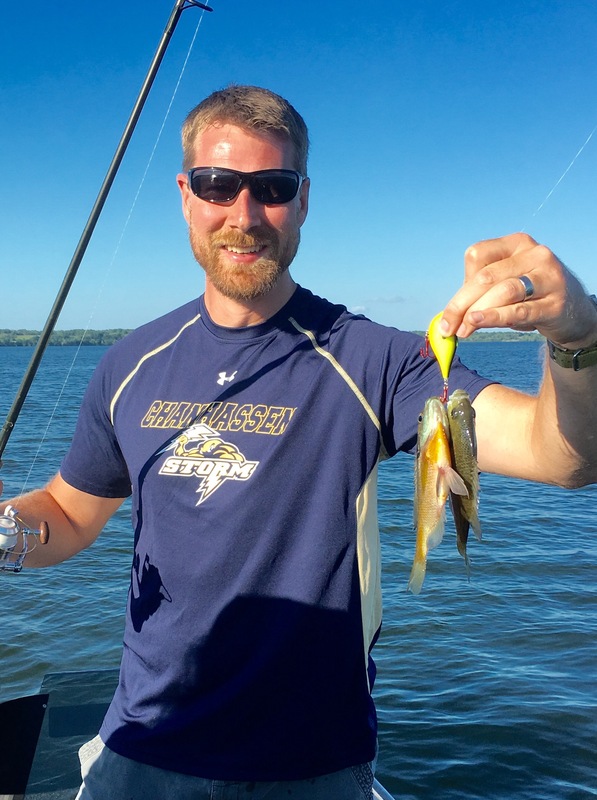 Good luck, and I will see you out there somewhere. 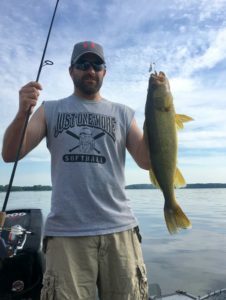 7/14/17 Catching walleye, largemouth bass, smallmouth bass, and pike on West Metro and Hutchinson area lakes. 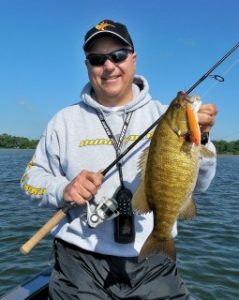 Spinnerbaits ovwer weedy shelves on reefs and crankbaits along deep weed edges are the ticket. 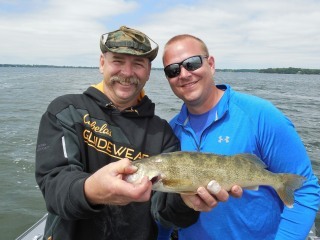 Summer time slots are filling up, but a few spots are left if you want to get in on some of this great action. Good luck, and I will see you out there somewhere. 7/3/17 Catching walleyes like crazy on Mille Lacs. 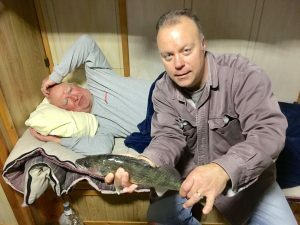 30 to 50 fish per morning from 12 to 28 inches. Catching fish live bait rigging with leeches on the mud flats, and power bobbing with leeches on the deep gravel. 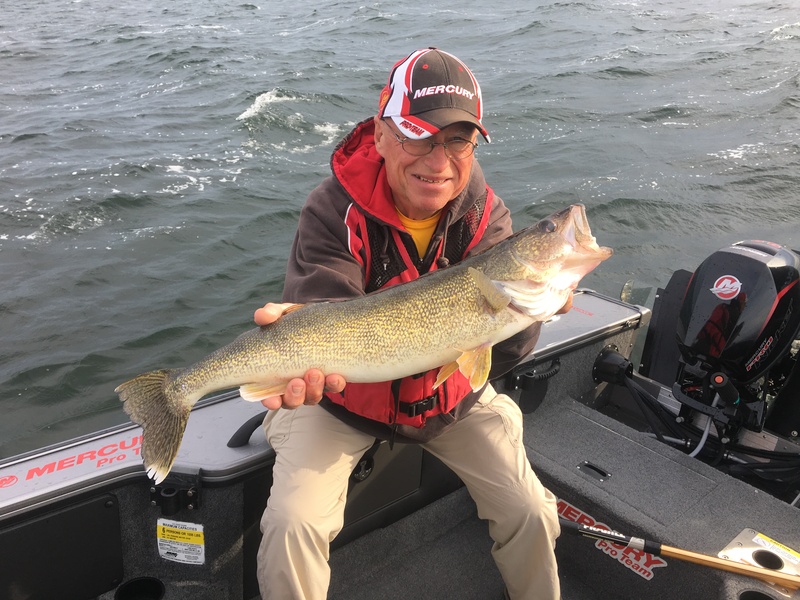 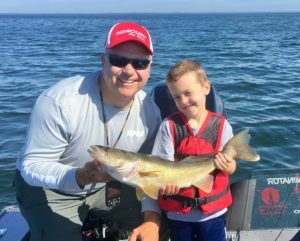 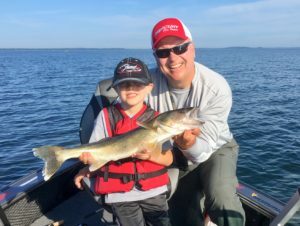 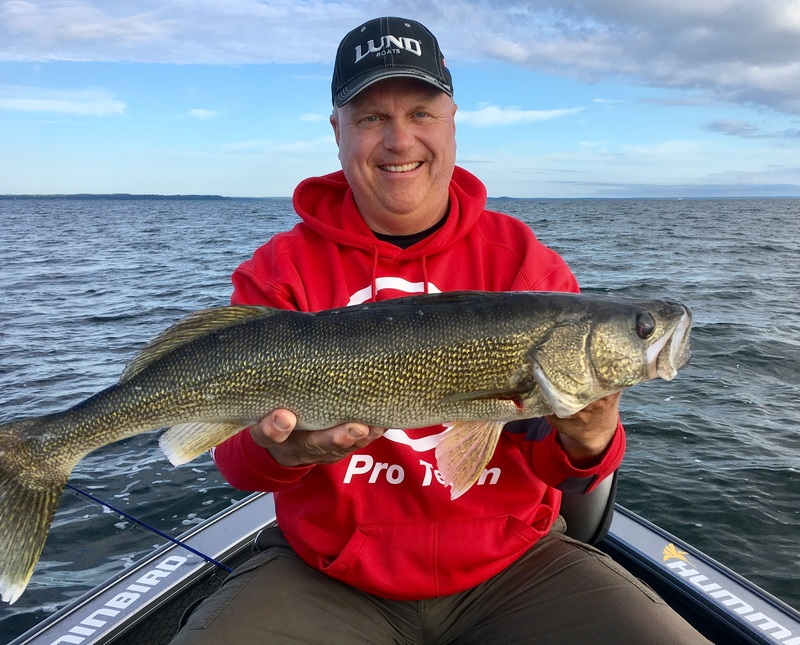 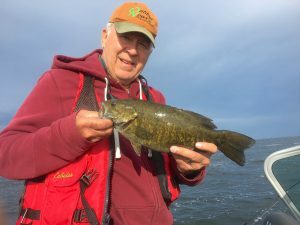 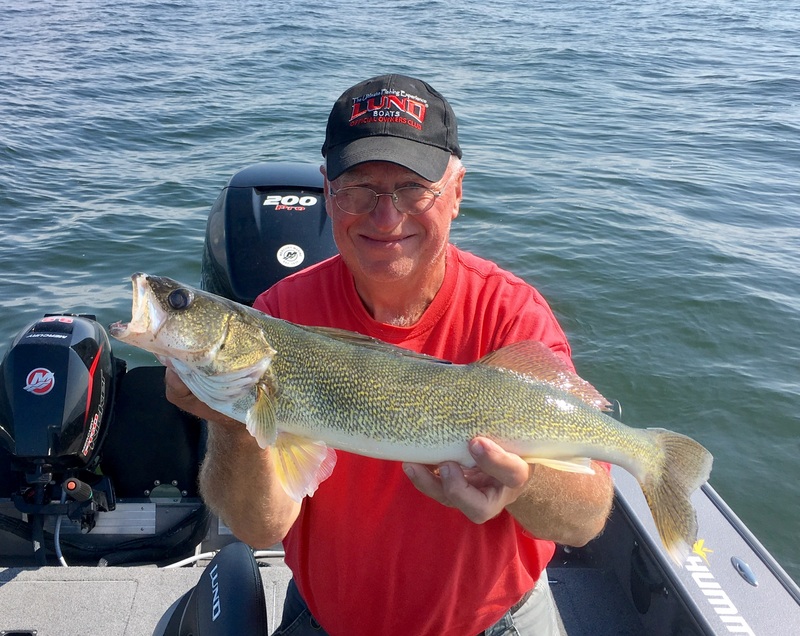 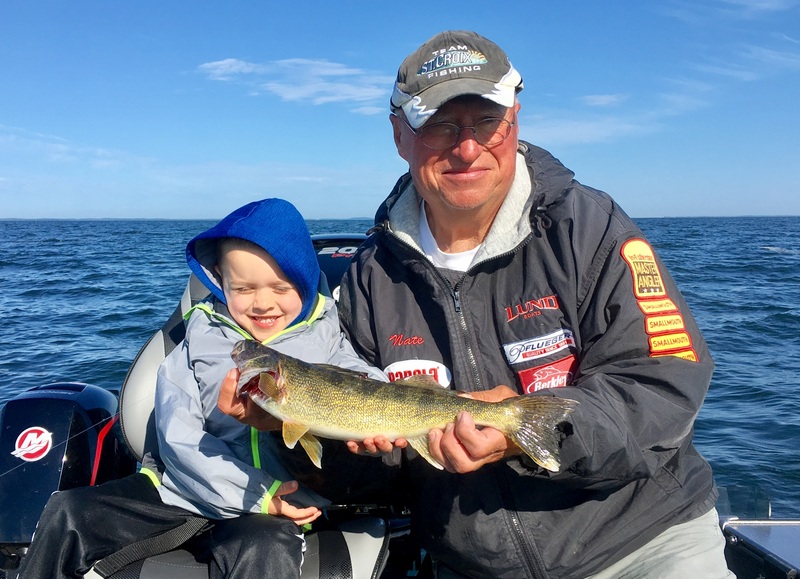 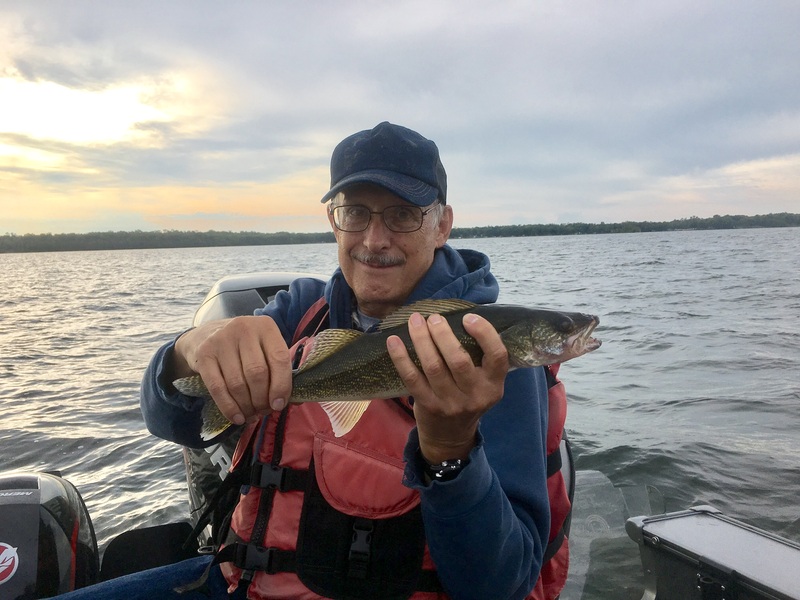 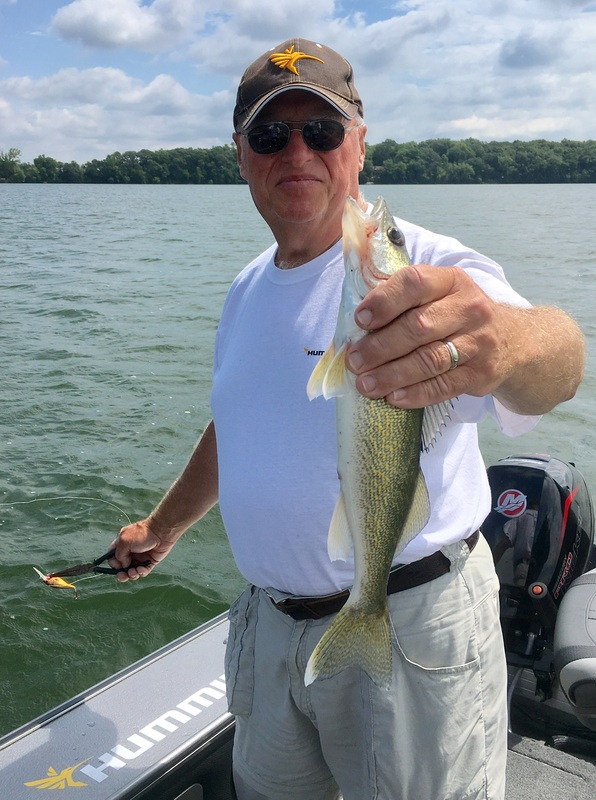 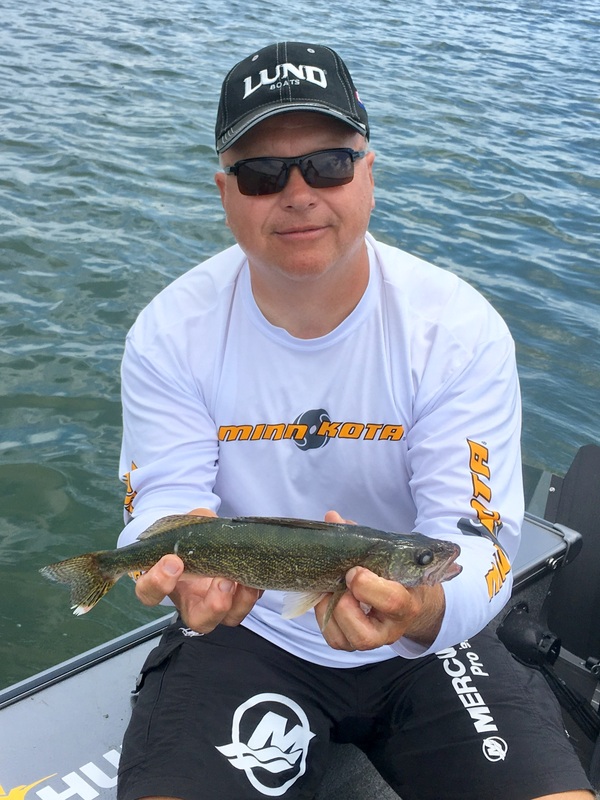 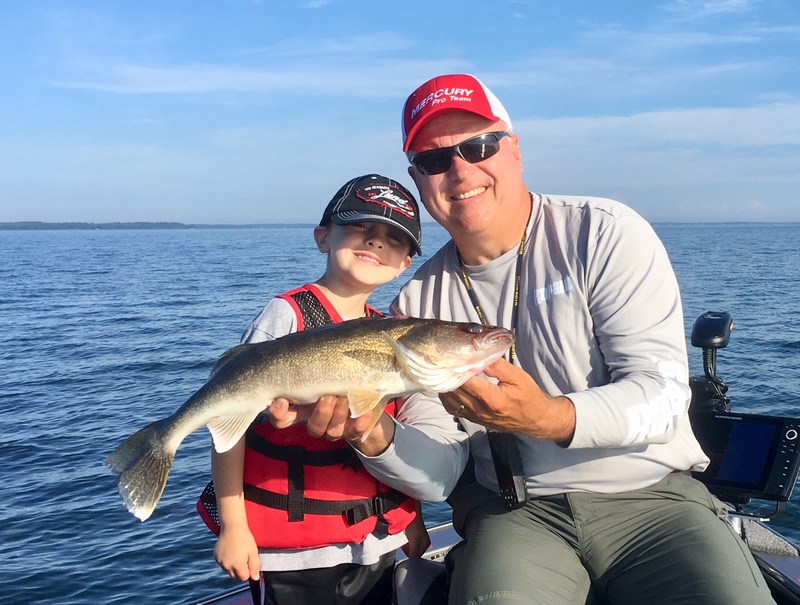 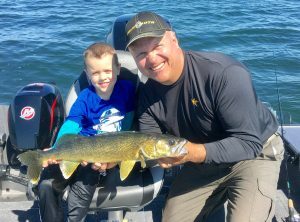 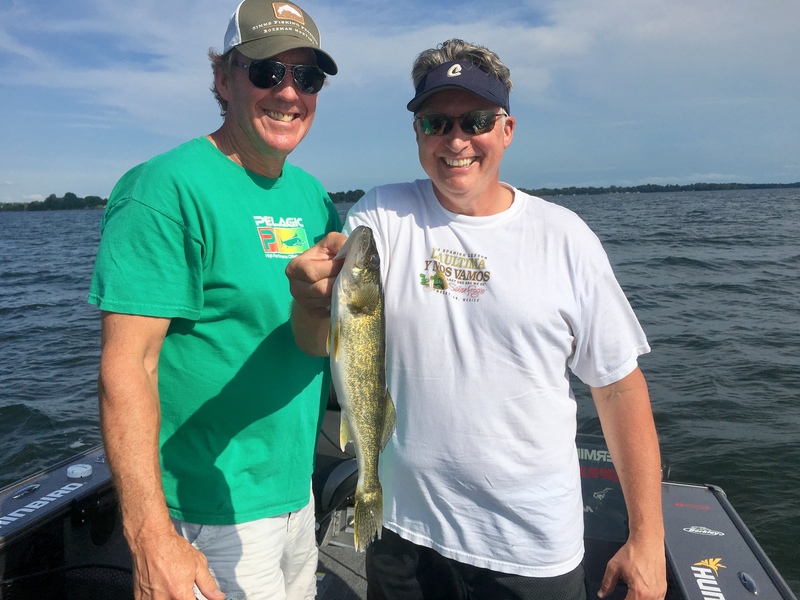 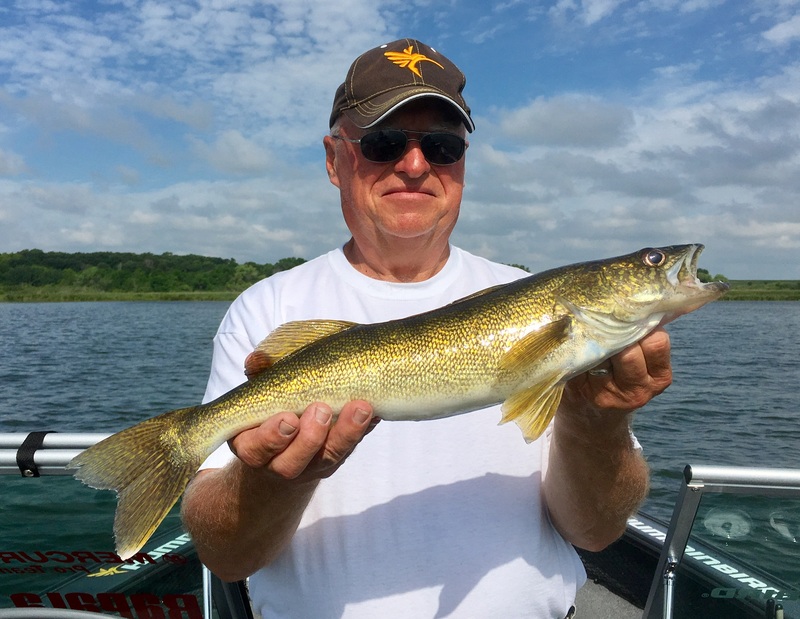 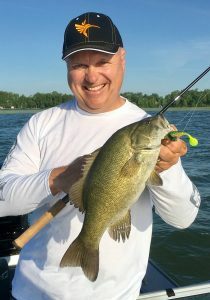 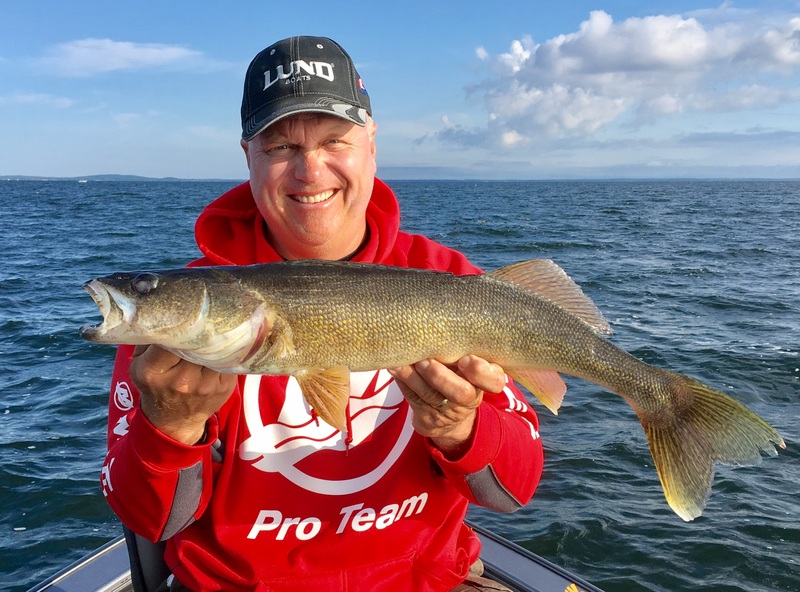 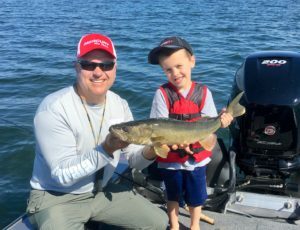 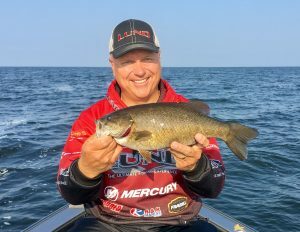 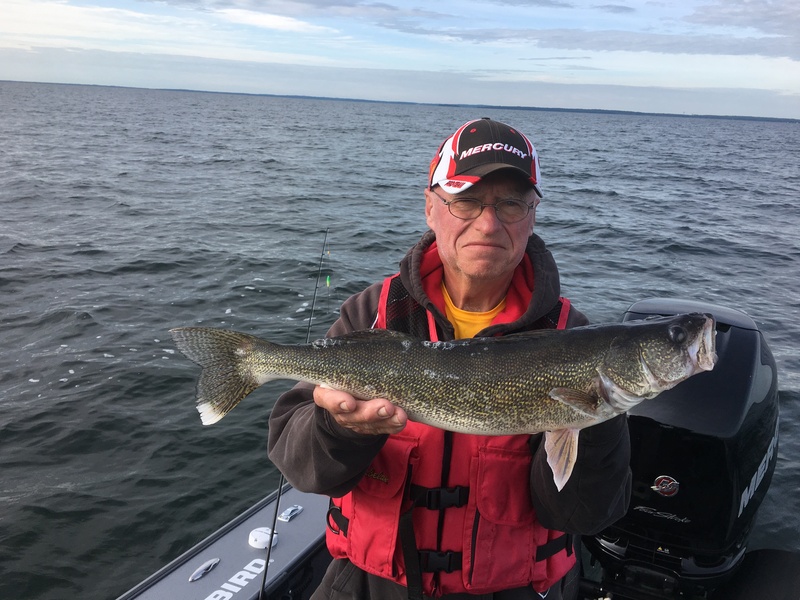 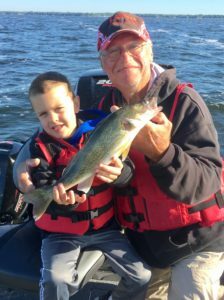 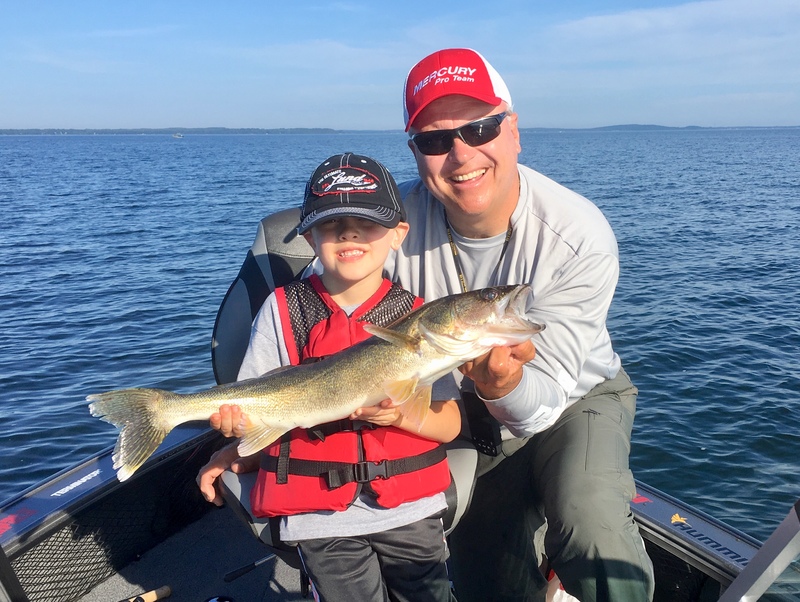 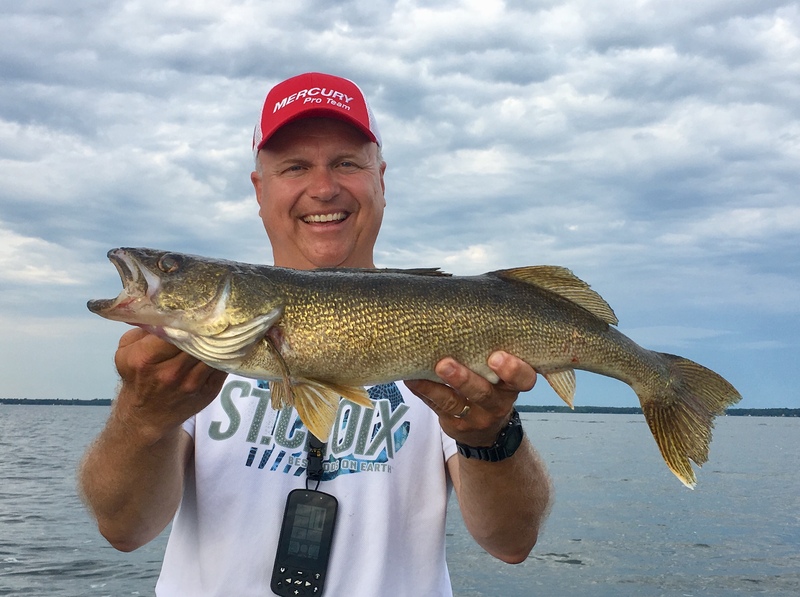 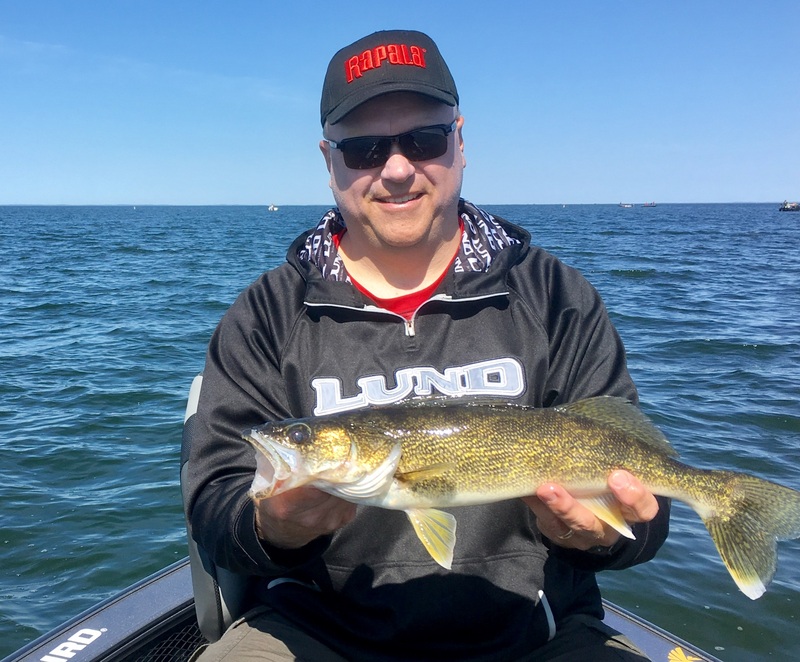 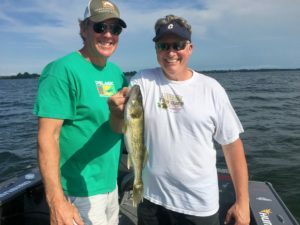 Walleyes close for three weeks on the big lake, but I have openings during that time for smallmouth bass, and some openings for walleyes starting again the last weekend of July when walleyes re-open on Mille Lacs. 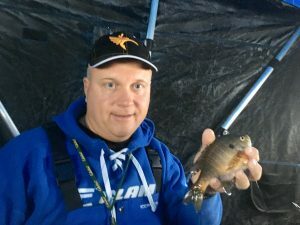 Good luck and I will see you out there somewhere. 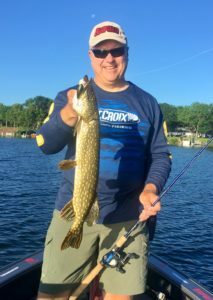 6/12/17 Catching lots of largemouth and smallmouth bass as well as pike in the west Metro and Hutchinson area lakes. 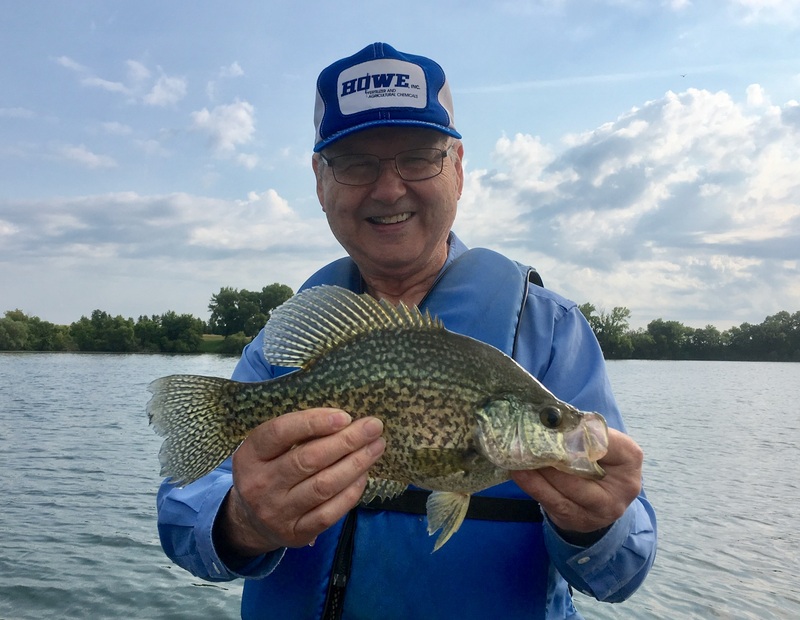 Also, the crappies are finished spawning and the sunfish are starting to bed, so catching tons of these in the same general areas. All of these fish are relatively shallow now, and are biting well. I have a few open dates if you want to get in on some of this action, or even combine bass, pike, and panfish for a full day. 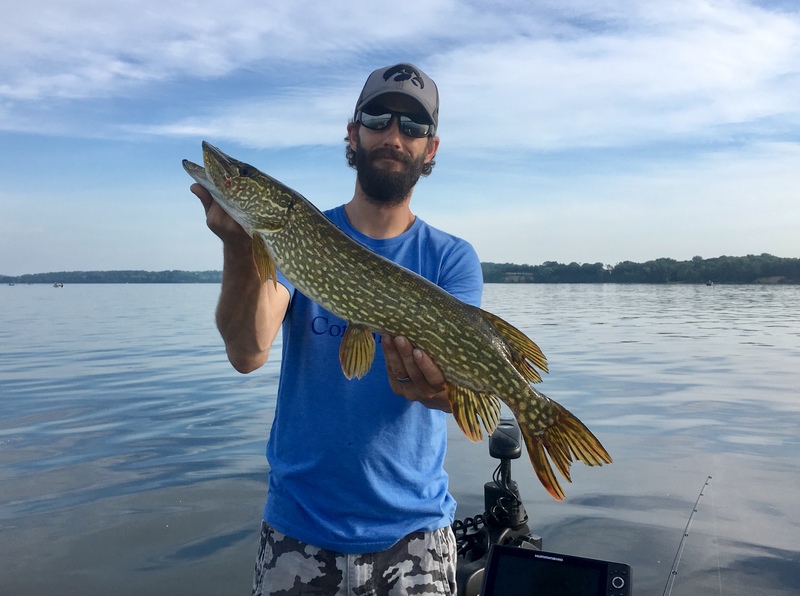 Good luck, and I will see you out there somewhere. 5/14/17 Opened the Minnesota game fish season on Lake Mille Lacs. Caught seventeen walleyes from 16 to 27 1/4 inches and five smallmouth bass from 17 to 19 inches on Saturday. 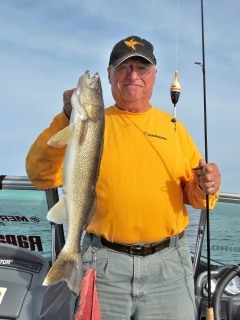 Rippin’ Raps and slip bobbers with leeches over shallow rock flats were the ticket. Tons of walleyes of all sizes on Mille Lacs, and great smallmouth fishing will go on all summer. 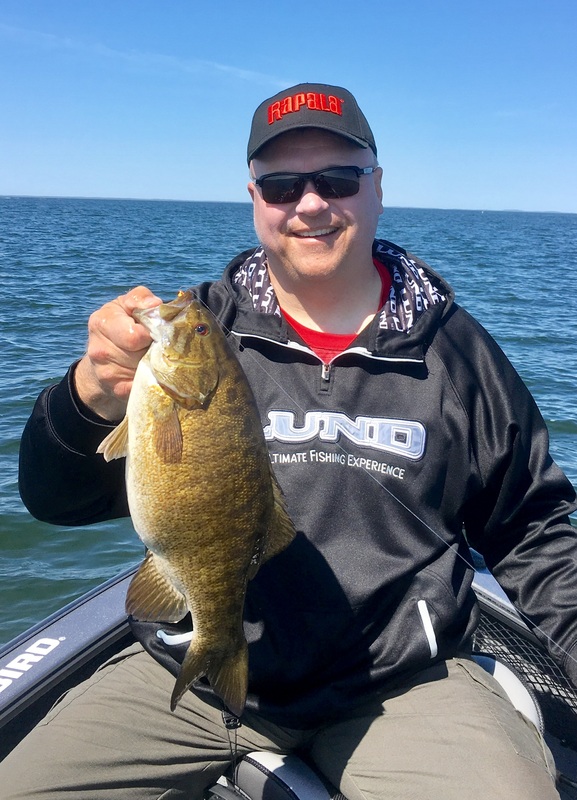 I have a few open dates left–contact me to get in on the great bite on Mille Lacs. Good luck, and I will see you out there somewhere. 4/23/17 Crappies are moving shallower and getting more aggressive on west Metro area lakes. 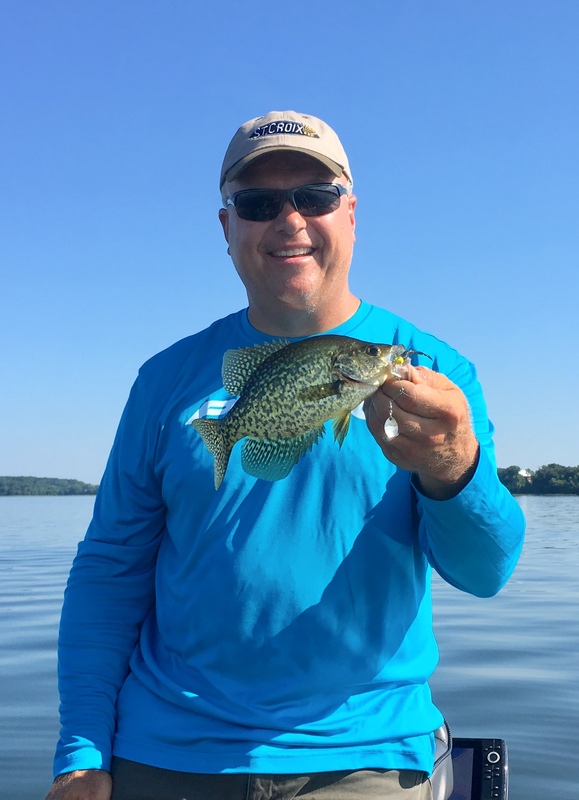 Catching lots of 8 to 11 inch crappies on a 1/16 ounce VMC Mooneye Jig tipped with a 2″ Berkley Powerbait Minnow suspended four feet under a slip float over ten feet of water with weeds. 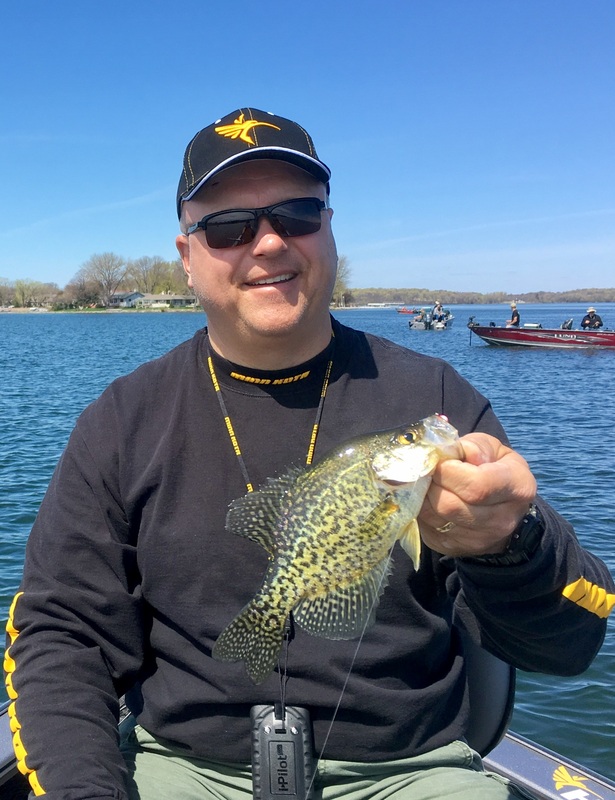 Call me to get out for some fast crappie action, or check out the short “Panfish How-to Videos” or “Hunting and Fishing the North Country: Springtime Crappie Fishing” on my You Tube Channel. 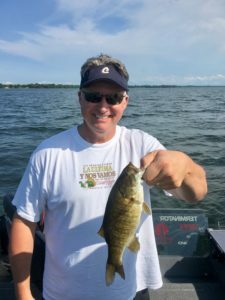 Good luck, and I will see you out there somewhere. 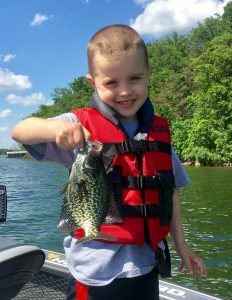 4/5/17 Crappies are starting in the mid-depth areas close to shallow bays on west metro area lakes. 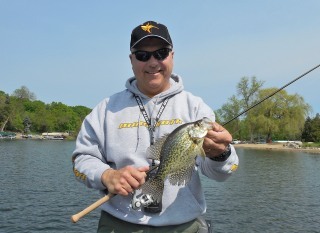 Jigs with soft plastics under a slip-float suspended above the crappies are working well. 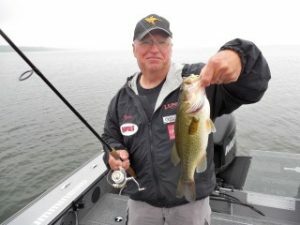 Bite should continue to improve and move shallower as the water warms. 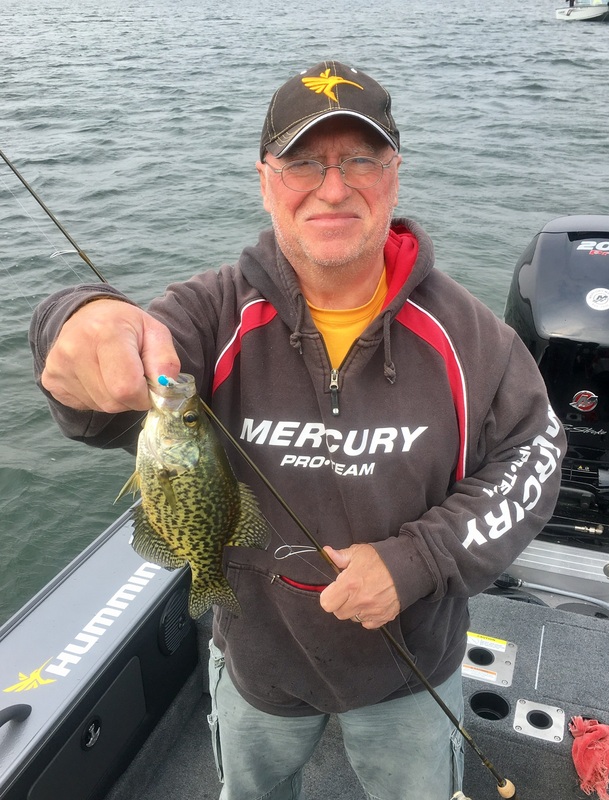 Call me to get in on some fast crappie action, or check out my YouTube channel for the second episode of Hunting and Fishing the North Country about springtime crappie fishing. 2/1/17 Catching walleyes in number of all sizes on Mille Lacs. 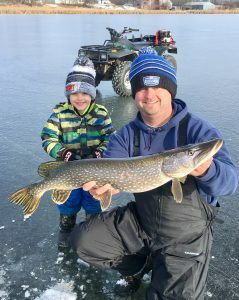 Good ice, and a good bite. 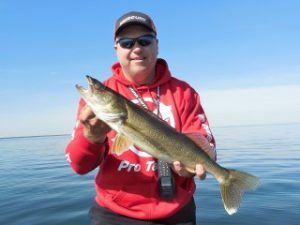 Catching fish jigging with rattle spoons and jigs, as well as on fathead minnnows under a float or a tipup. 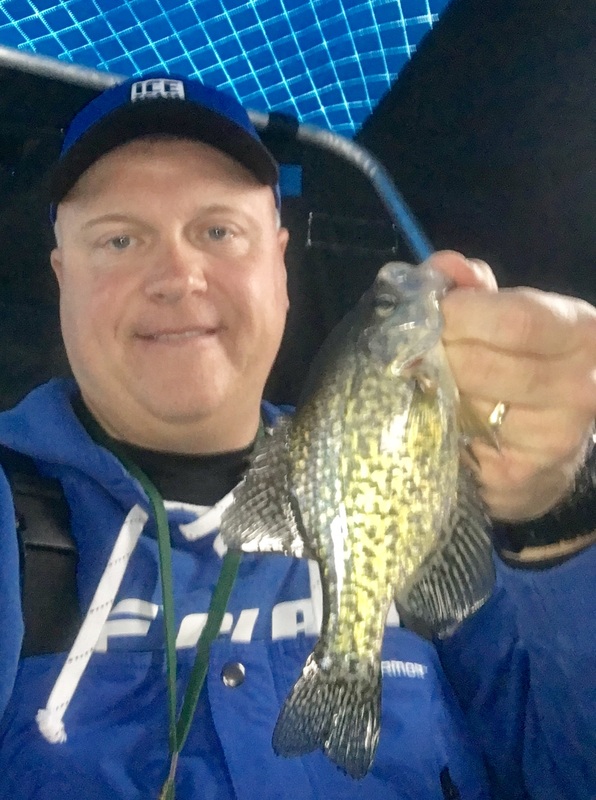 Deep gravel and mud are where the action is now. 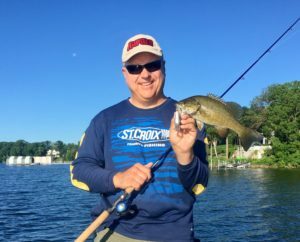 Good luck, and I will see you out there somewhere. 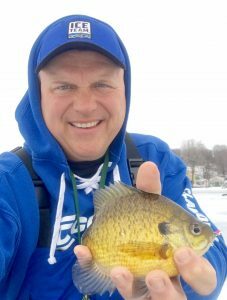 1/1/17 Still catching size and numbers of sunfish with a few crappies mixed in on west metro area lakes. Caught around sixty bluegills from 7.5 to 9.5 inches today with a couple crappies mixed in. 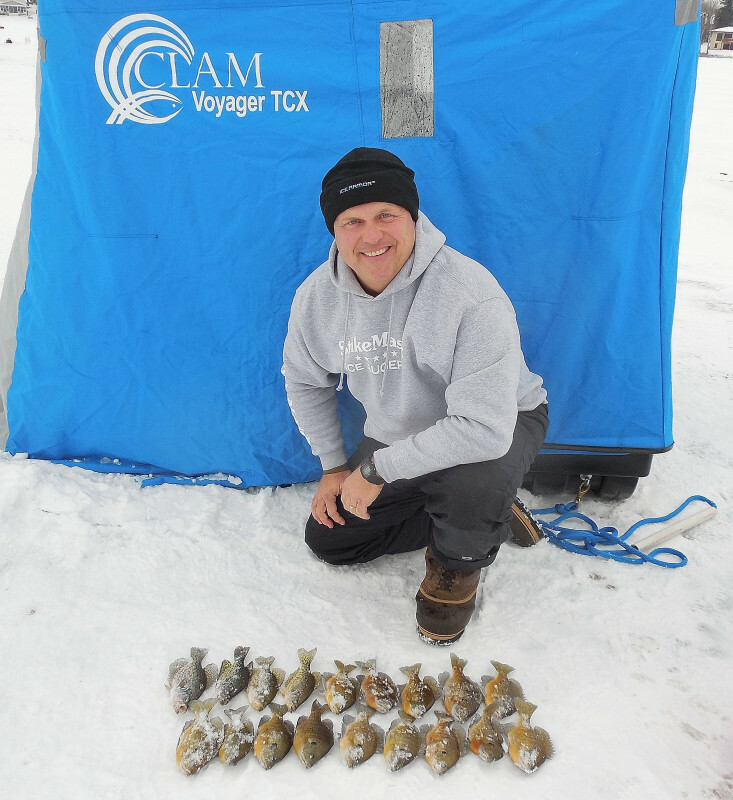 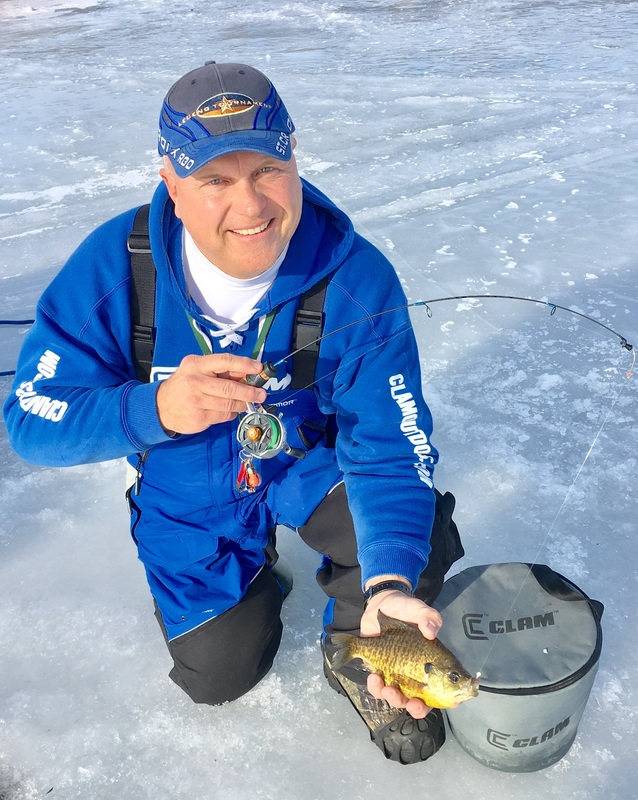 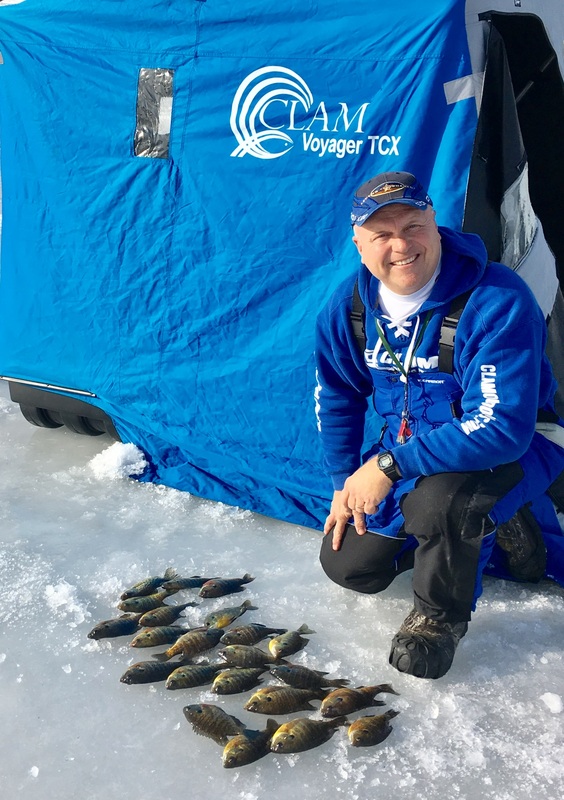 The early ice bite is on–contact me to get out for some hot panfish action. 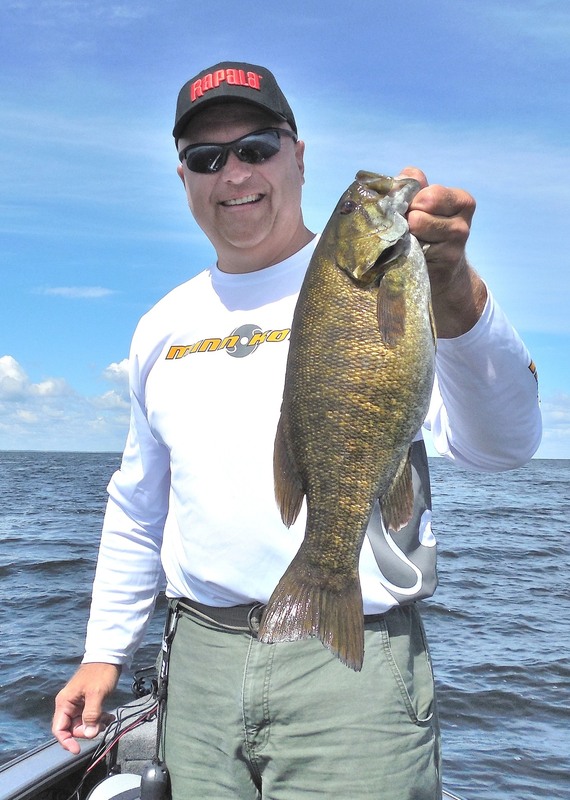 I have a few open dates this month. 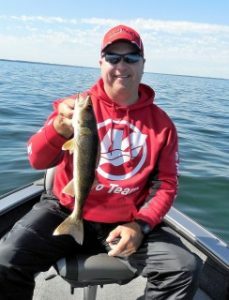 Good luck, and I will see you out there somewhere. 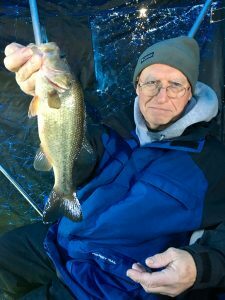 12/24/16 Enough ice to walk out on around west metro area lakes–five to eight inches. Good bite for bluegills and crappies is on. Catching both on small jigs tipped with waxies or Eurolarvae, and crappies are hitting small minnows under a slip float. Ice conditions and fishing will continue to improve. 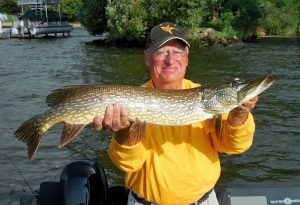 Contact me to book a trip with some great action. Good luck, and I will see you out there somewhere. 8/1/16 Catching largemouth, pike, muskies, and crappies on metro area lakes, both size and numbers. 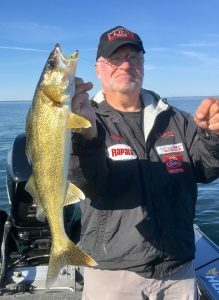 Spinnerbaits, Rippin’s Raps, jig spinners, and topwater are all working well. 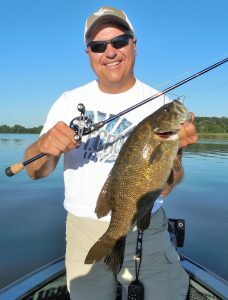 Catching largemouth, smallmouth, and pike on Hutchinson area lakes, again both size and numbers. Spinnerbaits, crankbaits, topwater, jig spinners, and Rippin’ Raps are all catching fish. Catching lots of walleyes and smallmouth of all sizes on Mille Lacs as well. 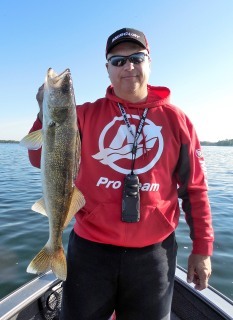 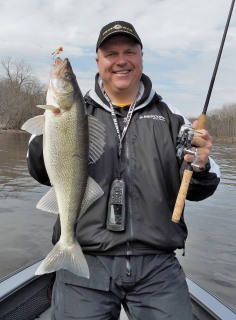 Walleyes on slip bobbers or livebait rigs with leeches. 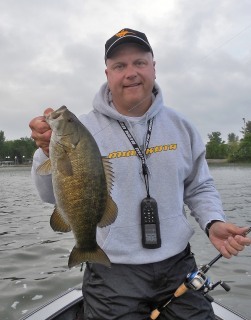 Smallies on tubes and crankbaits. 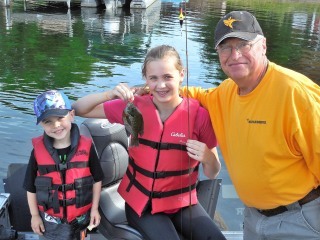 Great summer fishing going on all over. Good luck, and I will see you out there somewhere. 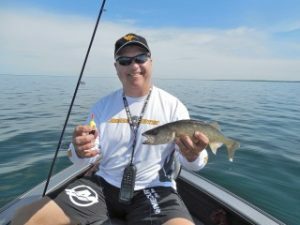 6/14/16 Catching big numbers and all sizes of walleyes on Mille Lacs lake. Power bobbin’ with leeches on mid depth rocks. 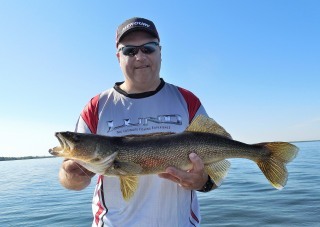 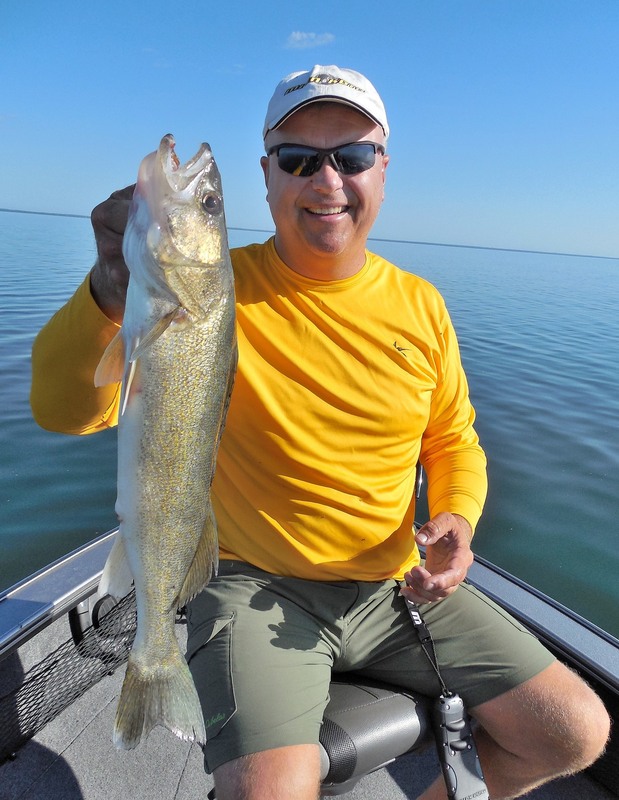 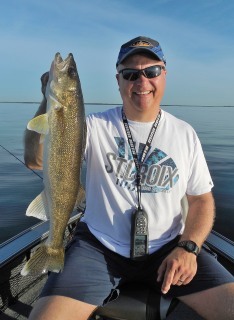 Easy fishing for everyone–30-50 fish days are common, with walleyes from 13 to 28.5 inches. 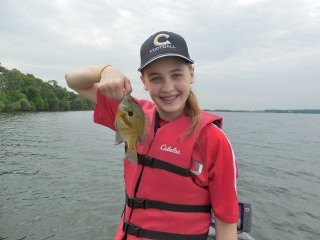 Also catching sunfish in huge numbers on metro area lakes right now. Nothing more fun for the whole family than sunfish on the beds. I have some open dates–contact me if you want to get in on either of these great fishing opportunities. 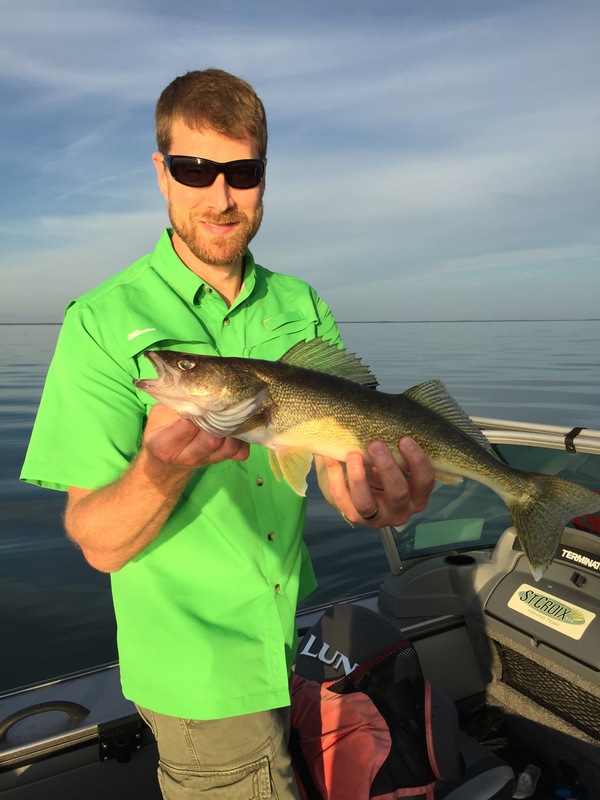 Good luck, and I will see you out there somewhere. 5/29/16 Catching lots of nice smallmouth, largemouth, pike, and a few walleyes on Hutchinson area lakes. Catching fish on jerkbaits, crankbaits, and spinnerbaits in three to seven feet of water. A few weekend and several weekday openings are left if you want to get out for some fast action. 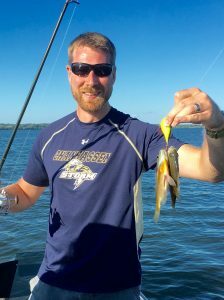 Good luck, and I will see you out there somewhere. 5/28/16 Caught twenty nine largemouth up to 20 inches and four pike on a west Metro area lake on Memorial Saturday. 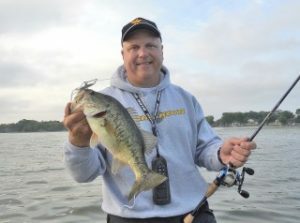 Spinnerbaits buzzed over the tops of cabbage weeds in four to eight feet of water was the best technique. 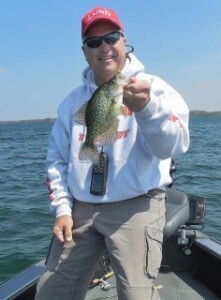 I do have some weekend and several weekday dates available for some fast action on Metro area lakes. 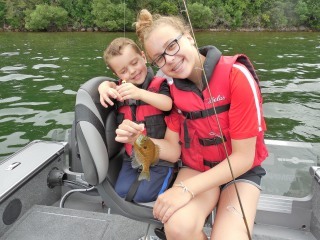 Good luck, and I will see you out there somewhere. 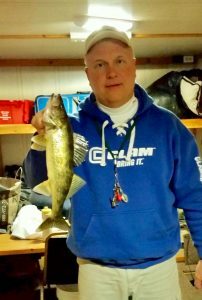 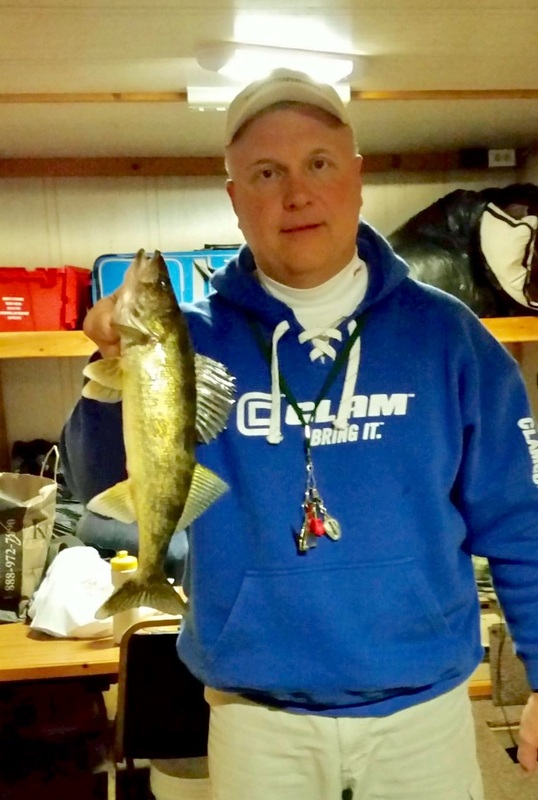 5/22/16 Tournament on Saturday and fun fishing on Sunday on Mille Lacs for walleyes. 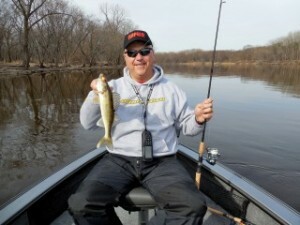 Lots of walleyes of all sizes in the lake, and they are biting. Half the fish measured, photo’d, and released in our tournament were over 20 inches. 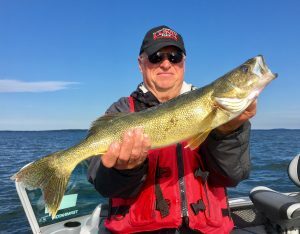 We caught a couple 23.5 inchers and a 28.5 on Sunday. 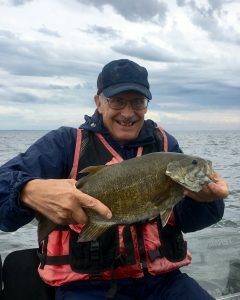 More than just one year class of small fish in the lake, despite theories to the contrary. 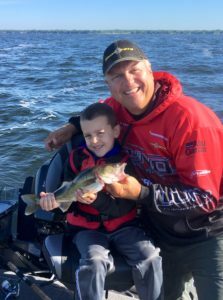 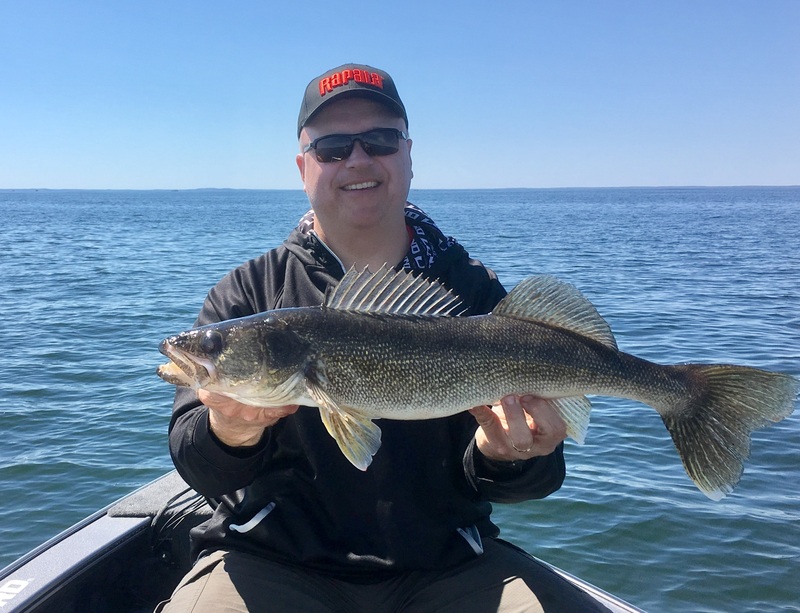 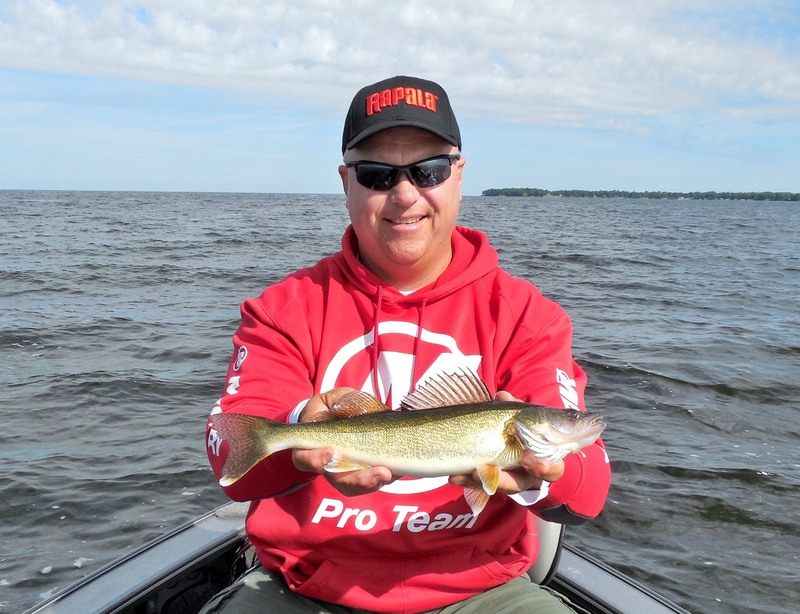 Don’t let media reports deter you–I have a few weekend and several weekday dates available if you want to come up to Mille Lacs and catch walleyes from 12 to 28 inches. Good luck, and I will see you out there somewhere. 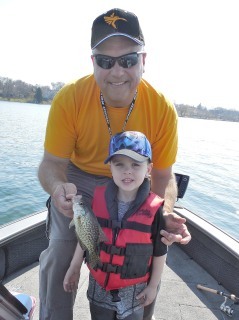 4/23/16 Crappies are biting fast and furious on west Metro area lakes. 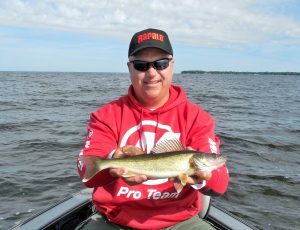 Small jigs tipped with 2″ Gulp! 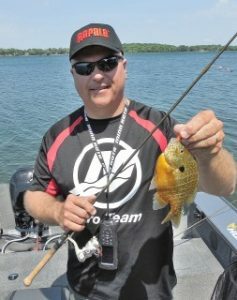 or Powerbait Minnows and grubs suspended under a slip float have been the best offering. 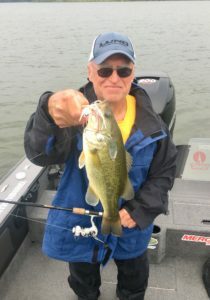 Water temp is rising, and the bite is improving. 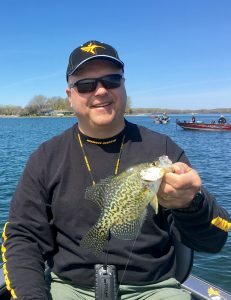 Contact me to get out and enjoy some great crappie action. Great time to get kids out fishing on a nice spring day for some fast action. Good luck and I will see you out there somewhere. 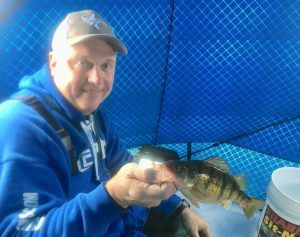 4/1/16 Catching walleyes and an occasional sauger on the Mississippi River, Pool 2, in St. Paul. Walleyes ranging from 10 to 25 inches so far. 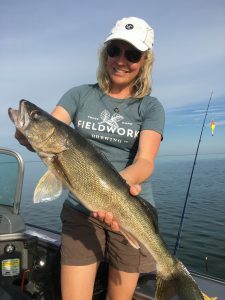 Deep holes under the current in the main channel as well as current breaks along steep dropping shoreline areas are where we are locating most fish. A 3/8 ounce to 1/2 ounce (depending on current) jig tipped with a fathead minnow fished vertically has been the best bait. 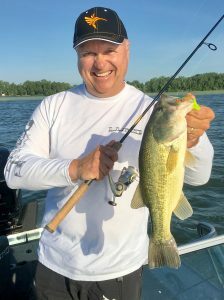 Glow white or chartreuse and pink have been the best colors, and an added rattle chamber has be helping fish find the jig in the stained water. 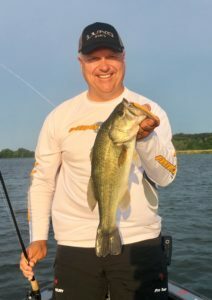 Had to go to stinger hooks a couple days due to short bites. 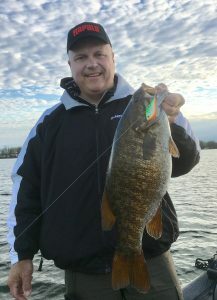 Bite should continue to get better with more big females over the next week or two. 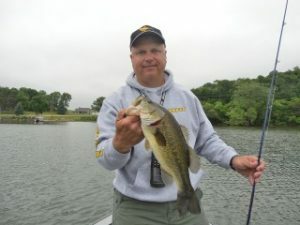 Good luck, and I will see you out there somewhere.